Apple is anticipated to hold its annual iPhone event on Sept. 12, where a slate of new products like a flagship "iPhone 8," LTE Apple Watch and more are expected to debut. 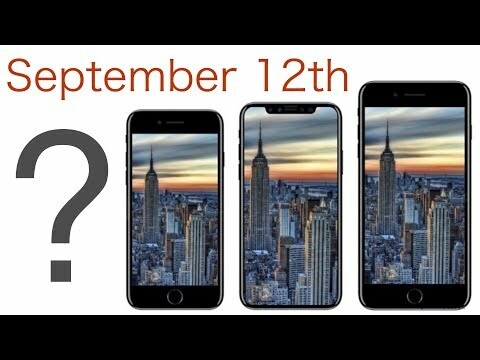 Check out all the latest launch rumors in this video. Is there some particular reason you couldn’t write an article to go along with this? I read a LOT faster than I can watch video, and I’m not always in a place where I can listen to it, rendering it useless to me. Excellent, as always. I've said it before, ai is now my 'one-stop' source for info, vid's, pricing, podcasts, etc. It used to be the MacWorld Magazine, but that is now, sadly, defunct. You guys should reach out to Jason Snell (former editor of MacWorld, now at SixColors) and see if he can add some editorials, guest spots on podcast, etc. Just a suggestion. Oh, and Dan Moren, too. You might bring a lot more of the 'Apple faithful' to your site. P.S. 'Grey' down all the 'black' bars on the website...it will make it look cooler and more inviting. Again, just a suggestion. I fall in the same camp. Guys, too much work! Maybe they could 'Fax' it to you, also! Vid's are the future not 'written' articles. Just say'n. No offense. Get a larger iPhone and some AirPods....you won't regret it. We already covered this in text form two days ago. It’s also prominently featured in the carousel at the top of every page on the main site. New Mac mini? It is much overdue now! ...and a touch bar keyboard perhaps...? All you need is a 2012 i7 MAC Mini that you add Max RAM and a SSD and they are as fast as anything out there! $800-1200 on E-Bay! For some reason, I had missed that. The day must have got busy. No worries, it has been a busy week! Sometimes I forget stuff we cover, and I read and edit *everything*. Heh. Lol, the “future” is watching 5 minutes of some amateur droning on and on, to receive about 17 seconds worth of written information that you could glean literally at a glance?? In your “future” everyone must have MUCH more spare time & patience. Why did Vine fail while Twitter thrives, if no one wants words, only vids? In your effort to sound all haughty, enlightened, and superior- sadly.... you instead come across as a pompous, deluded, self-aggrandizing know it all. Uh no, video is not "the future" of news consumption. Written text is here to stay. As noted we can read faster than we can watch.